Emergency Beacon is a vital app for all outdoor enthusiasts. Emergency Beacon was made as a tool to help victims of natural disasters, falls, avalanches, or any other incident where they need to be rescued. The app features the ability to send your current gps coordinates by email or sms to a list of preset contacts, a built-in emergency survival guide, and an audible alarm to help rescue teams find your exact location. Why not just call 911? According to Gizmodo, a 1-minute phone call is 460,800% larger than a text message. After a natural disaster, cell phone calls often cannot be made due to overloaded cell towers. Text messages and emails don't require as strong a signal and will more easily be put through in a natural disaster. 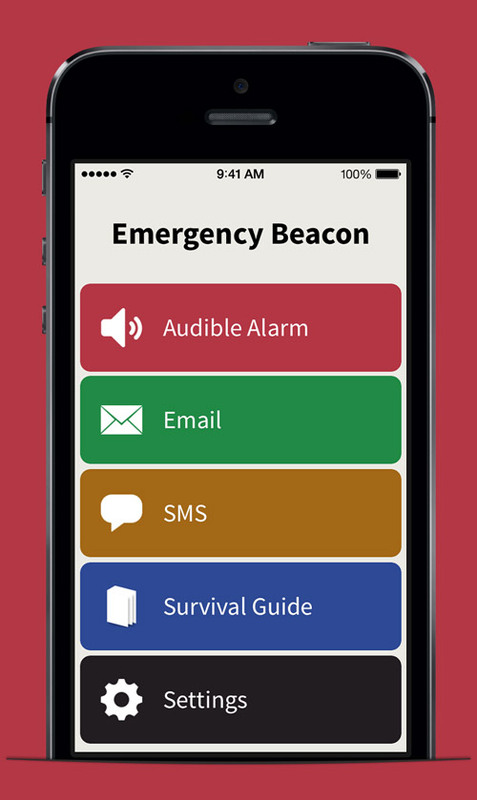 Emergency Beacon is available for purchase ($0.99) on the iOS App Store. It is currently compatible with iPhone, iPod touch, and iPad. Check it out and download today! If you like it, give it a rating and help spread the word! Many emergency systems can cost hundreds. Emergency Beacon costs less than a dollar! Emergency Beacon takes up just under 1 MB of space on your phone. That's less than most songs! You already carry your iPhone in your pocket. Why add extra weight to your belt when you can use what's already there? Once the app is open an audible alarm is just one click away. After that, an email or sms message is just two more. When you're in an emergency, you don't want to make anything more difficult than it has to be. Turn on the alarm, send your messages, and put your phone to sleep. The audible alarm will continue to go off, and the app will draw barely any power from your phone. Just make sure to close your other open apps. Please email us at mobile@nickentin.com.